This blog features great tips, tricks and tutorials for the Mac, iPhone and iPad. Learn how to get the most out of you Apple gear and feel free to ask questions! iPhoto is a great way of organizing, sorting and editing photos but I don't like it when my personal and work photos mix together. Luckily, you can create more than one iPhoto library. In this video I'll show you how to create separate photo libraries for your work and personal photos, that way they'll always stay separate. In order to create or switch between iPhoto libraries you'll need to know how to get to the iPhoto library management window. 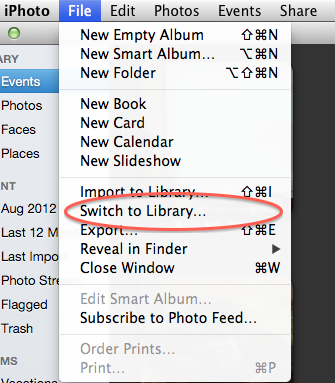 In iPhoto '11 you'll be able to find it under the file menu by choosing "Switch to Library." If you're using an older version of iPhoto you'll have to hold down the option key when you launch iPhoto. Love It To Bits is a great resource for Mac, iPad, and iPhone tips and tricks. Explore our blog, check out our apps, and even get some personal training. At Love It To Bits we love Macs, apps, and you! Learn how to get the most out of your Apple products in the comfort of your home. Scheduling is as easy as a few clicks. Schedule a training appointment. Check out our money counting app in the app store now! Great for learning money values or just counting the change in your pocket. Learn more about it here or buy it right from the App Store.